Take a unique tour through the cattails with an interpreter in our 10 person canoe and take a look at life below the water. 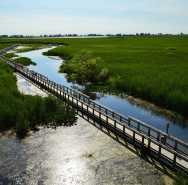 This is a great way to experience a side of Point Pelee few get to see. For more information, visit our website above.